When it comes to insulation, forget cotton. 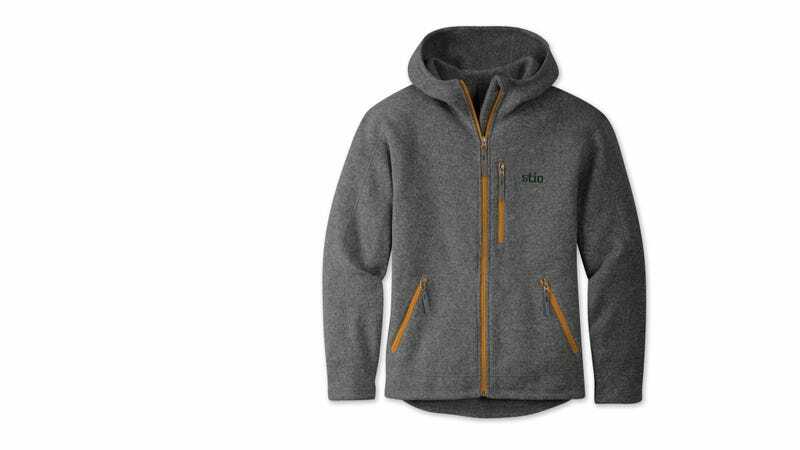 This fleece hoodie will shed water while staying much warmer and, with a knit face, looks much classier than you’ll feel. Stio is a new outdoors apparel brand out of Jackson Hole. They make nice stuff that’s functional, but comfortable too. And man, are you going to be comfy in this hoodie. Inside, it’s the soft brushed fleece you’ll be familiar with from Polartec jackets and the like. But outside, the knit face give it the same look as a fancy merino wool sweater. Like that material, fleece insulates when wet, but unlike wool, you can just throw the Wilcox in the washing machine. Chunky YKK zippers and chunky construction give the hoodie a reassuring feel of quality, while the oversized hood and kangaroo handwarmer pockets further boost comfort. The fit flatters athletic body types without being overly form fitting. It’ll fit over a button-down shirt just fine, but also under a jacket. $159 and it’s available in grey, blue or black.